One-to-One and Small Group Tutoring help individuals learn to read, to write, and to speak English, and to improve their math skills. Tutoring is free and confidential. Students and tutors work together for an average of 2 hours per week to meet students’ goals. Tutor Training Workshops prepare new volunteers to tutor adults using an interactive, learner-centered, whole language approach. The Workplace Literacy program provides on-site instruction for English language learners working at local businesses. 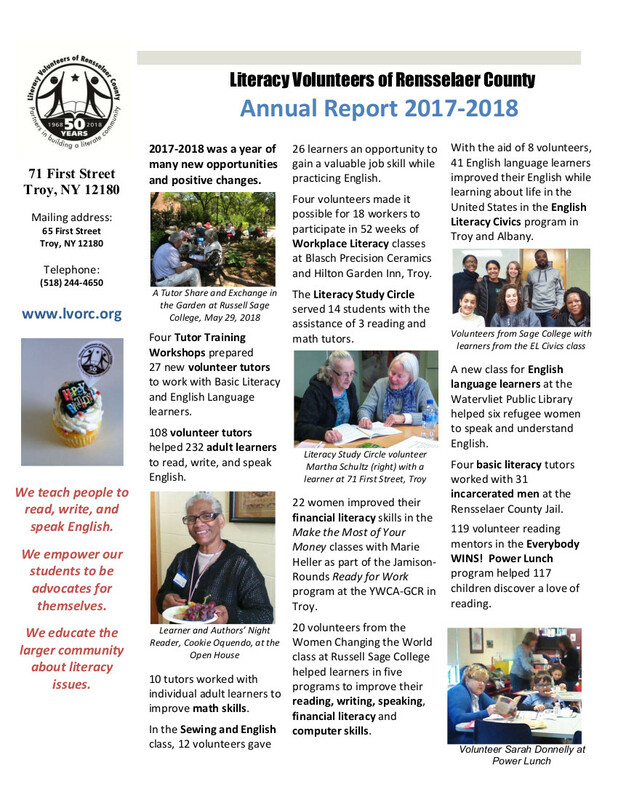 English Literacy Civics classes meet for 25 weeks from October through May for a total of 150 hours of instruction to English Language learners in Albany and Troy. The Sewing and English Class gives women a chance to learn valuable employment skills while practicing their English every Saturday at the former McManus Center on Herrick Street. Citizenship Preparation classes at the Rensselaer Public Library give students the information and skills they need to pass the Naturalization Test and interview. A Financial Literacy program is offered as part of the YWCA’s “Ready to Work” trainings at the Troy YWCA. LVORC ‘s Make the Most of Your Money serves women participating in these trainings. Everybody Wins! gives elementary school children a chance to spend time reading with positive reading role models. Reading mentors from area businesses and the community meet weekly with elementary children in elementary schools in Troy and Albany. Telephone Conversation Partners helps English language learners practice English on the phone with a friendly volunteer for 30 minutes each week. Learners converse with volunteers on the telephone to strengthen their speaking and listening comprehension skills. Tutoring at the Rensselaer County Jail gives incarcerated men a chance to get reading and math help from volunteer tutors while enrolled in Questar III classes at the jail.